Tag Archives: Lon Chaney Jr.
Bela Lugosi as Dracula in DRACULA (1931). Welcome back to THE HORROR JAR, your home for lists of odds and ends about horror movies. Up today, a list of the UNIVERSAL DRACULA movies, a series that began and ended with Bela Lugosi playing Count Dracula, but the rest of the movies in between, strangely enough, did not feature Lugosi. And the fact that Lugosi is so identified with the character when he only played him in the movies twice is a true testament to his performance in the original DRACULA. He’s pretty much remembered as Dracula based on his work in that film alone. Unlike Boris Karloff, who played the Frankenstein Monster in the first three films of the Universal Frankenstein series, and then returned in HOUSE OF FRANKENSTEIN (1944) to play the evil Dr. Niemann, thus appearing in four of the eight Frankenstein movies, Lugosi only played Dracula on two occasions in the movies, and the second time was in the comedy ABBOTT AND COSTELLO MEET FRANKENSTEIN (1948), yet he is just as readily identified as Dracula as Karloff is as the Frankenstein Monster. Screenplay by Garrett Fort, adapted from the play by Hamilton Deane and John L. Balderston, based on the novel by Bram Stoker. Released before FRANKENSTEIN (1931), this was the movie that began the Universal monster series of the 1930s and 40s. Tod Browning’s masterpiece, the movie that made Bela Lugosi a star. Silent star Lon Chaney was originally intended to play Dracula, but his untimely death from throat cancer paved the way for Lugosi ultimately getting the part. At times talky and slow-paced, DRACULA nonetheless is full of hauntingly rich images. The decrepit Castle Dracula, Dracula walking the streets of London, and simply Lugosi himself all contribute to the iconic visuals found in this film. Lugosi steals the show as the undead king of the vampires, but receives fine support from Edward Van Sloan as Van Helsing, Dwight Frye as Renfield, and Helen Chandler as Mina. Indeed, Frye is every bit as memorable as Renfield as Lugosi is as Dracula, and if you’ve seen this movie, it’s hard to forget either one of them. DRACULA is chock-full of classic lines uttered by Lugosi. 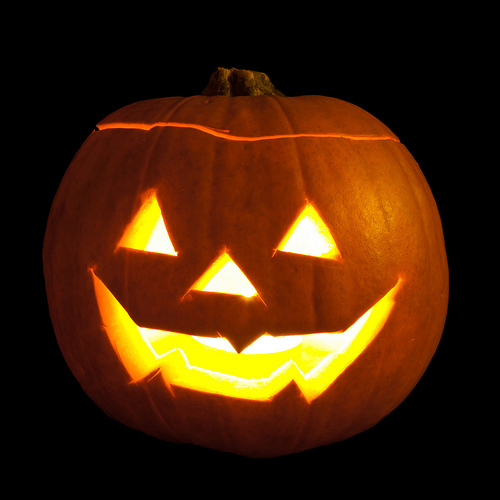 A must-see at Halloween time. Screenplay by Baltasar Fernandez Cue, based on the screenplay by Garrett Fort, adapted from the play by Hamilton Deane and John L. Balderston, based on the novel by Bram Stoker. Back in the day, Universal used to film Spanish versions of their movies using an all-Spanish cast and crew on the same sets as the American version, and so as a result, we have this special treat of a movie: an entirely different director, screenwriter, and actors using the same sets as DRACULA making an entirely different movie. Technically, the Spanish version of DRACULA is superior to the Tod Browning version. There’s more going on with the camera and it plays much more like a movie than a stage play. It’s also a more risqué production, as it highlights the sexual side of the story in ways the Browning version didn’t. However, I won’t go so far as to call it a superior version of the tale for the simple fact that the Tod Browning version had Bela Lugosi, and he alone made the U.S. version the better movie. Of course, I would have absolutely loved to have seen Lugosi star in this Spanish version. Now that would have been one remarkable movie! The first of two very underrated movies in the DRACULA series. Evidently, back in 1936, the writers hadn’t figured out yet how to resurrect a vampire, and so Count Dracula remains dead in this one, as this story focuses on his daughter. So, no Dracula and no Bela Lugosi, two strikes which have forever worked against this film. 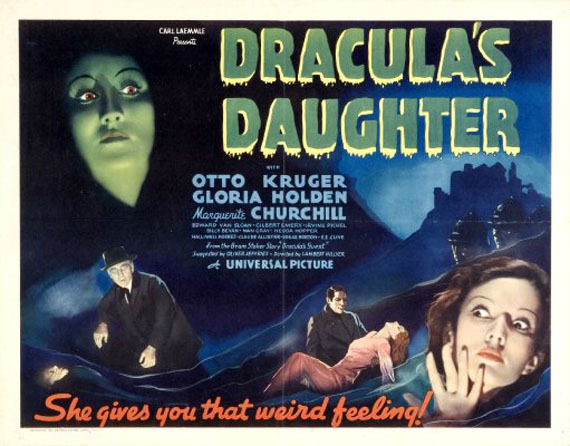 That being said, DRACULA’S DAUGTHER is a very good horror movie, one of Universal’s best! It has a solid story, immediately beginning right where DRACULA ended, and finds Van Helsing (Edward Van Sloan) facing a murder charge for the death of Dracula. He turns to his friend Jeffrey Garth (Otto Kruger) for help, who in turn becomes embroiled with Contessa Zeleska (Dracula’s Daughter), who unlike her father, seems uncomfortable as a vampire and wants to be cured. Still, she’s every bit as deadly as her daddy! Gloria Holden is very good as Dracula’s daughter, and it’s nice to have Edward Van Sloan back as Van Helsing, but it’s Otto Kruger and Marguerite Churchill who steal the show in this one, Kruger as the intellectual hero Jeffrey Garth and Churchill as his sassy secretary Janet. These two share so much chemistry I wish they had returned to take on other Universal monsters. Count Dracula: Lon Chaney Jr.
Lon Chaney Jr. as Dracula in SON OF DRACULA (1943). Another underrated Dracula film. 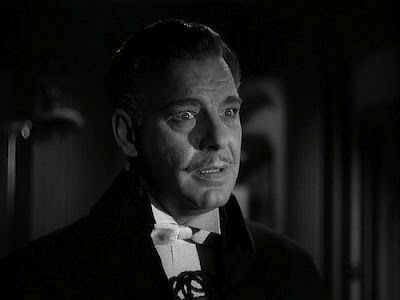 Lon Chaney Jr. takes on the role of Count Dracula, and he’s actually quite good here. In spite of the film’s title, he’s not really playing Dracula’s son— or is he? He’s identified only as Dracula in the film, and there’s nothing in the story to indicate for a fact that he’s the son of Dracula other than the movie’s title. There is speculation among some of the characters in the film that he might be a descendant of Dracula, but another character states that he is the original Dracula. I suppose, you could imagine him to be Dracula’s son, but since this isn’t ever clarified in the story, it would be purely speculation. Regardless, Dracula uses the name Alucard (Dracula backwards) in this movie, in order, I guess, to travel about incognito. This one is steeped in atmosphere as it takes place in the Deep South of the United States, and you can also feel the humidity. The atmosphere almost reminds me of an old zombie movie. It also has a neat story where Dracula’s main love interest, the occult-loving Katherine Caldwell, has her own agenda and is more manipulative than Dracula here. Chaney is quite good as Dracula, and he gives the role a completely different feel than Lugosi did. It’s nice to see Chaney play evil, as opposed to sympathetic Larry Talbot aka the Wolf Man. Chaney’s Dracula possesses an aura about him that immediately makes the characters around him uncomfortable and uneasy. 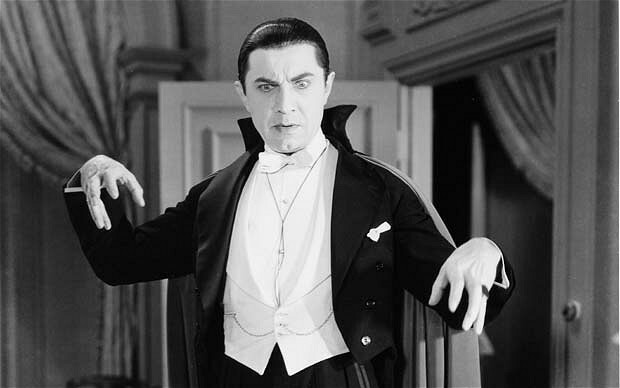 He’s less charming than Lugosi, less mysterious, but more in-your-face evil. Ah, let the Universal Monster Bash begin! Yup, beginning with HOUSE OF FRANKENSTEIN, Universal would make three straight movies featuring their three main monsters: the Frankenstein Monster, Dracula, and the Wolf Man, all of this happening of course due to the success of their earlier hit FRANKENSTEIN MEETS THE WOLF MAN (1943). 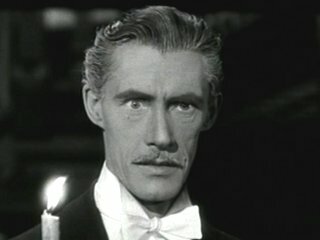 John Carradine takes over the role of Dracula here, and finally, we get to see Dracula resurrected (it took the writers long enough to figure this out!) as we watch the nefarious Dr. Niemann (Boris Karloff) remove the stake from Dracula’s skeleton, and before our very eyes, Dracula materializes back to life. HOUSE OF FRANKENSTEIN has a rather uneven plot. The first third of the movie features Dracula, and once he is killed off, it morphs into a straight sequel to FRANKENSTEIN MEETS THE WOLF MAN as Dr. Neimann leaves Dracula behind and sets his sights on the Frankenstein Monster and the Wolf Man. John Carradine is very good as Dracula, although I’ve always preferred Lugosi and even Lon Chaney Jr. in the role. Carradine adds a sense of elegance to the Count, and he definitely has a presence about him, but to me, his performance has always had one major flaw: I never found him scary in the role. All three Universal monsters return, and this time Dracula gets more to do and survives a bit longer than he did in HOUSE OF FRANKENSTEIN. Unfortunately, HOUSE OF DRACULA isn’t quite as good as HOUSE OF FRANKENSTEIN. Everything about this production seems rushed. It screams for an additional twenty minutes or so. Again, Carradine is respectable as Dracula, and again, he’s simply not all that scary. This was originally going to be called HOUSE OF THE WOLF MAN before Universal decided to add Abbott and Costello and turn it into a comedy. Strangely, this decision, which many people including Lon Chaney Jr., hated, didn’t stop this movie from becoming one of the best in the Universal Monster series. The big news here was that Bela Lugosi returned to play Dracula, a role he hadn’t played since the original DRACULA in 1931. It still amazes me that these are the only two movies in which Lugosi ever played Dracula, although he did play a vampire in MARK OF THE VAMPIRE (1935) and THE RETURN OF THE VAMPIRE (1943). ABBOTT AND COSTELLO MEET FRANKENSTEIN works so well for two main reasons. One, it’s hilariously funny. It’s one of Abbott and Costello’s best movies. And two, the monsters in this film all have much bigger moments than they did in the previous two movies. Lon Chaney Jr. has a major role. As Larry Talbot, he’s involved in the hunt for Dracula, and he has lots of scenes as the Wolf Man. Glenn Strange, reduced to having little more than a cameo as the Frankenstein Monster in the previous two movies, has lots of screen time here and even speaks lines of dialogue! But it’s Lugosi who steals the show in his return as Dracula. Other than Abbott and Costello, he’s the main character in this movie, as it’s his plot to take Lou Costello’s brain and put it into the skull of the Frankenstein Monster, in the hope that he’d be able to control the Monster better with Costello’s simple mind. Lugosi has many fine moments. He gets to be scary and he seems to be having a lot of fun. Terrific movie, terrific performance, and a fine way to end the Universal Dracula series. “Young people. Always making the most out of life. While it lasts.” — Bela Lugosi as Dracula in ABBOTT AND COSTELLO MEET FRANKENSTEIN. Hope you enjoyed this edition of THE HORROR JAR, and I’ll see you again next time with more horror movie lists.